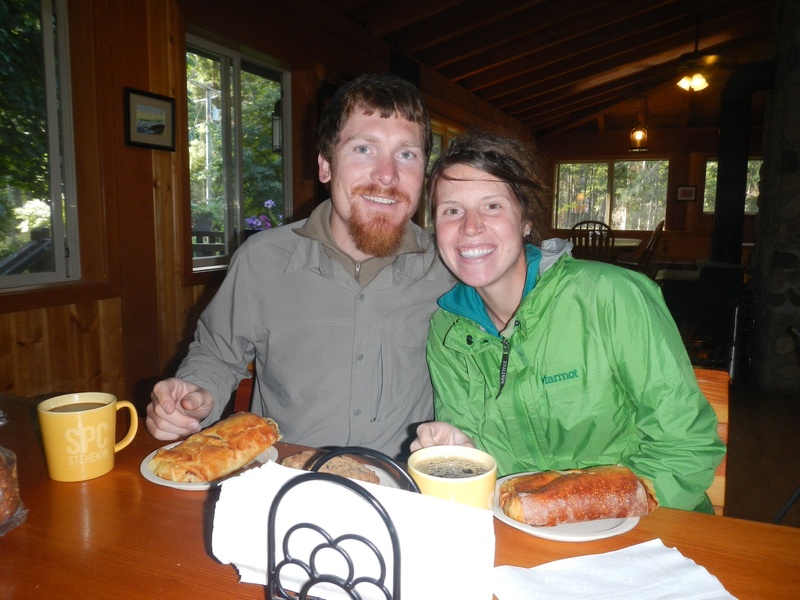 We awake, rested yet sore as always at the Cascadia Inn in Skykomish, WA. 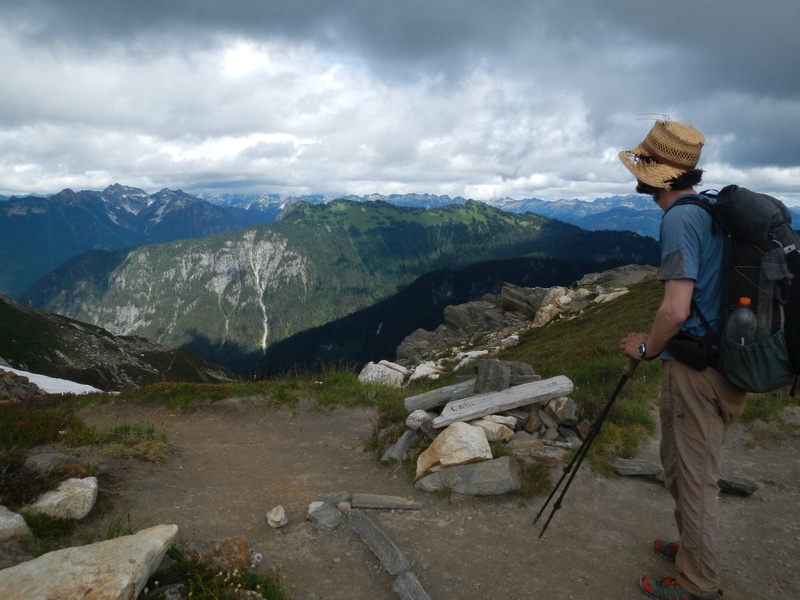 Today isn’t going to be a zero after all, as another hiker reminded us that Monday is Labour Day, which means the Stehekin post office will be closed with our food drop. 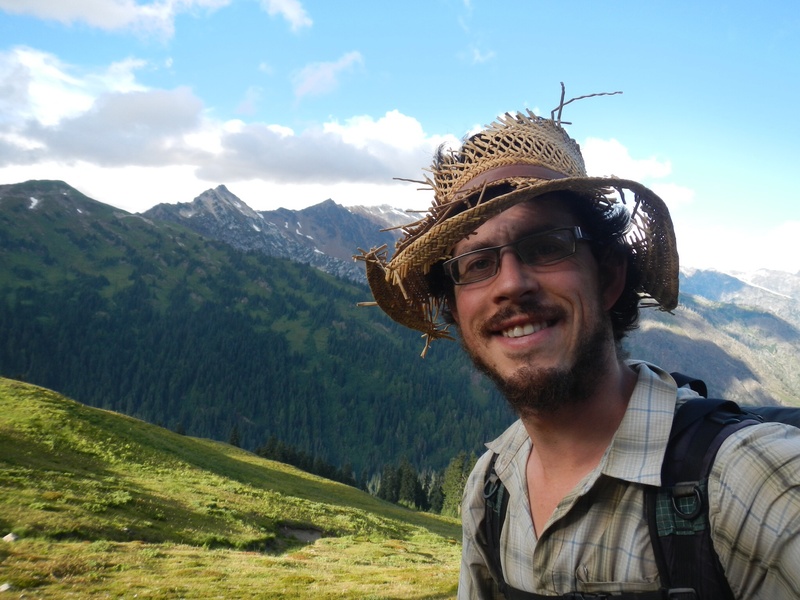 We decide to hike the 104 miles of the supposedly arduous Section K in 4 days to arrive before the P.O. closes on Saturday. We hitch 16 miles back to the trail at noon in the back of a pickup. 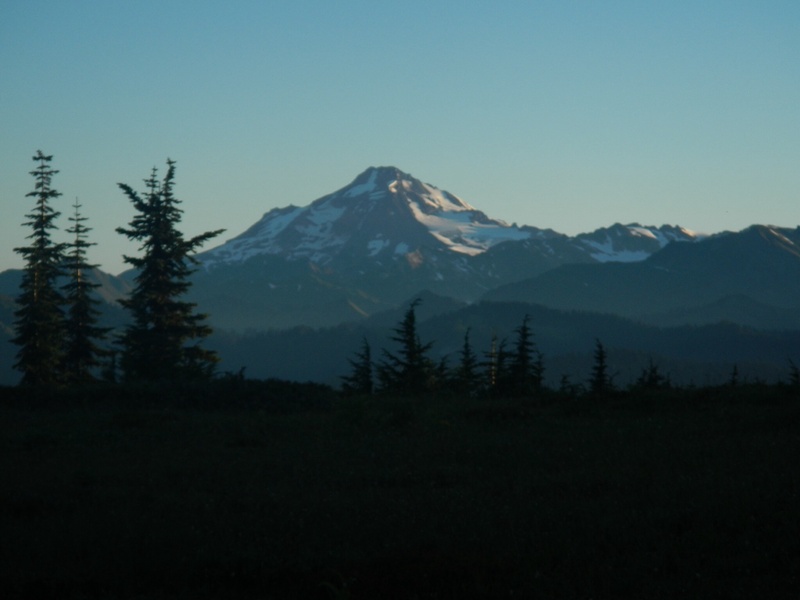 We cram into the bed of the truck with a large dog kennel, packs on one side and hikers on the other. I quickly realize my hat is in serious jeopardy. The dog kennel separates me from my hat, which is bouncing around the other side of the truck in the 60 mph winds. After a few tense minutes it safely lodges between the side of the truck bed and a propane tank, much to the relief of T-Fox. At 1pm we start walking, fresh tomatoes in hand courtesy of our chauffeur. 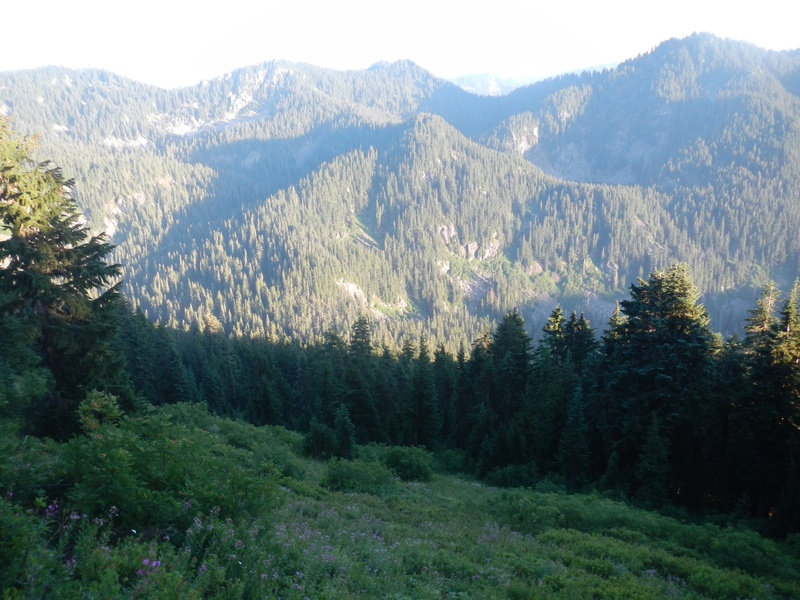 We climb out of Steven’s Pass towards a camp spot at Grizzly Peak. 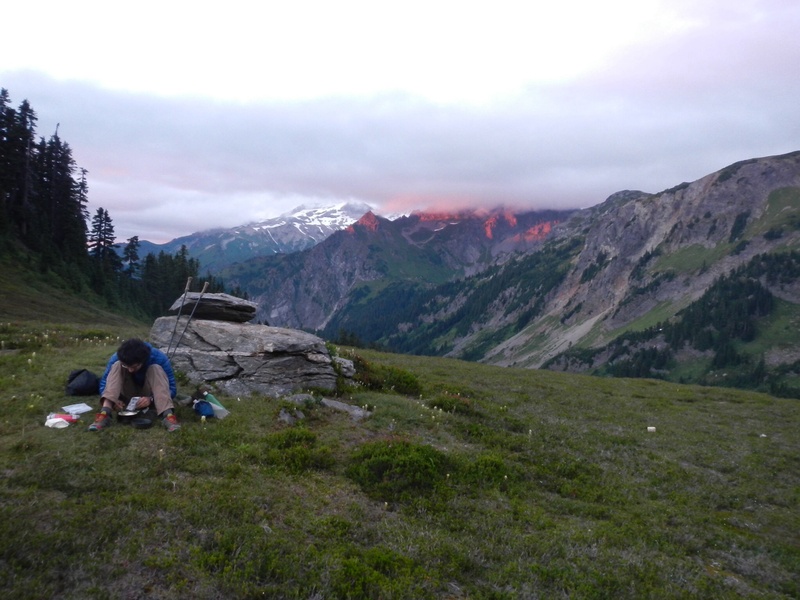 At 7pm we arrive, set up camp and make dinner. Tonight’s meal is pesto spaghetti – a trail favourite made with whole wheat spaghetti, dry pesto sauce packets, a foil pouch of tuna, milk powder and lots of Parmesan and olive oil. 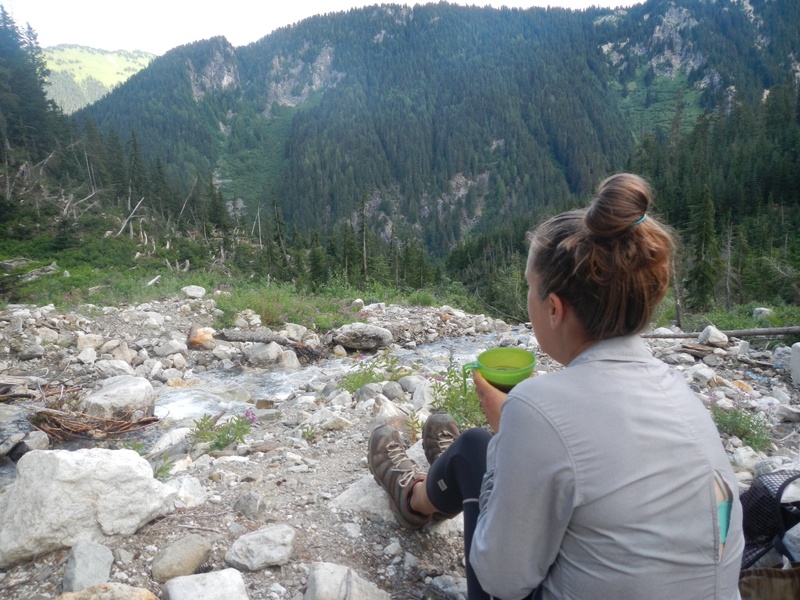 Parmesan is a wonderful trail food that seemingly never goes bad and always tastes good. We’ve got a full pound of it for Washington. We awoke to “super-dew” which we saw coming but couldn’t easily avoid. 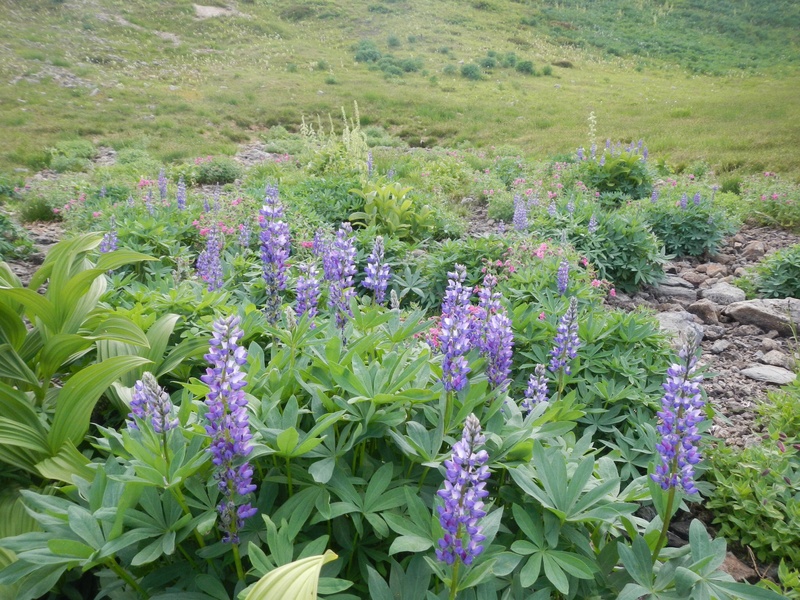 We wear rain pants for the morning as we walk through alpine and sub-alpine vegetation of blue lupine, corn lily, red columbine, cow parsnip and Indian paintbrush. 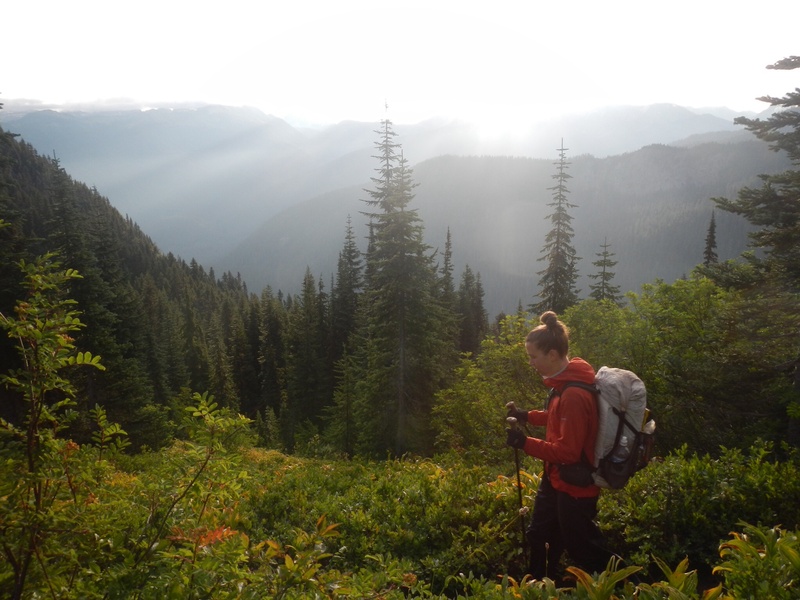 The terrain in Washington has been spectacular lately and we’re excited to be entering the Glacier Peak Wilderness. 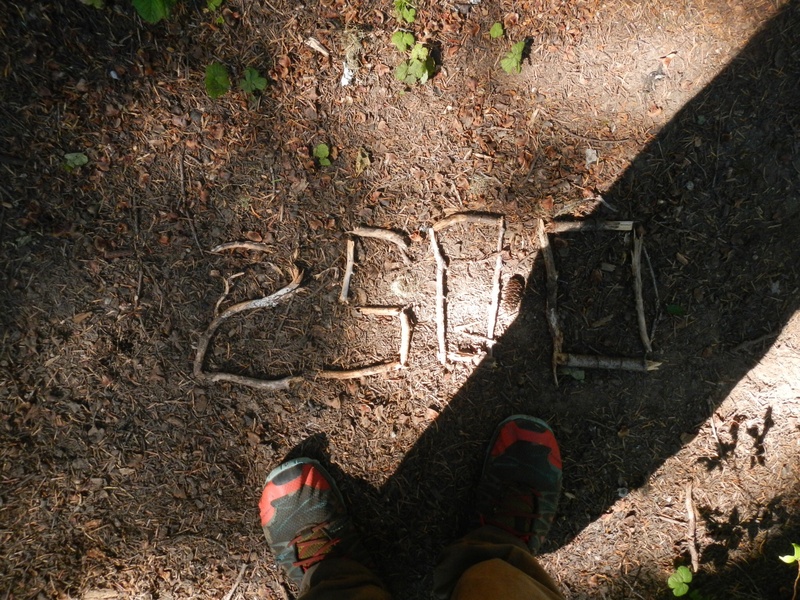 At mid morning we pass a trail side “2500” monument constructed of bark. It’s pretty nuts. We’re at a cool point in the journey now where the bulk of the work is behind us and we’re mentally free to enjoy the walk with less obligation. 160 miles left seems like nothing. The end is tangible and we’ve got mixed feelings about it. It’ll be a relief to be done walking and we’re looking forward to next chapter of our lives, but living outside has been great and we love Washington. Thankfully these areas are close to home, so the walk feels more like reconnaissance for future adventures. 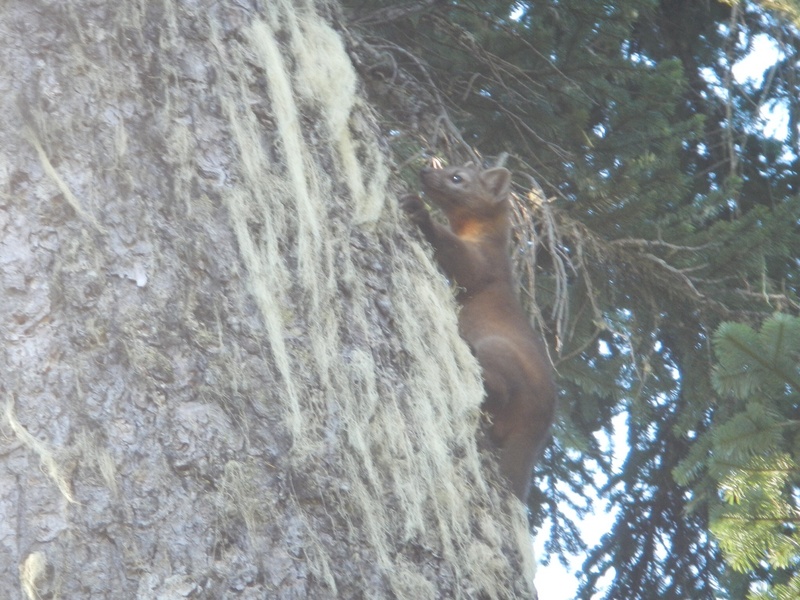 Late in the morning we hear scrambling and look up to see a large mustelid climbing on the bark of a Douglas Fir. Is it a Marten? Fisher? The cat sized animal awkwardly leaps back and forth between tree trunks with its stubby legs, while regularly stopping to peer and huff. It’s one of neatest wildlife encounters of the trip, second only to the grey fox in SoCal. We later learn all the Fishers have been trapped or logged out of their homes in Washington, so we conclude it was a Marten. Early evening we are caught by Knock-Out, who is also racing for the Post Office. I give him my drivers licence in case he makes it and we don’t. 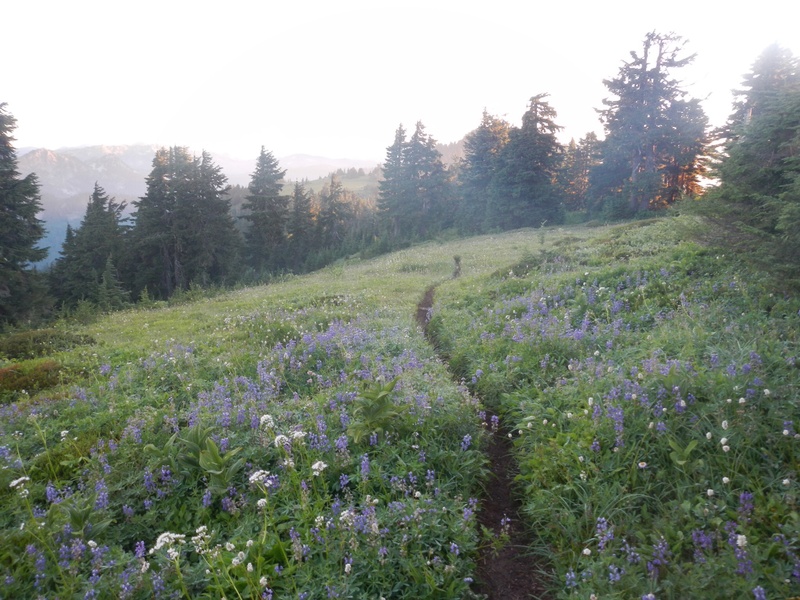 At 7pm we crest Red’s Pass and quickly descend into an alpine bowl to make camp after 26 miles. I awake at 5:30am as usual and pack up while water boils for coffee. 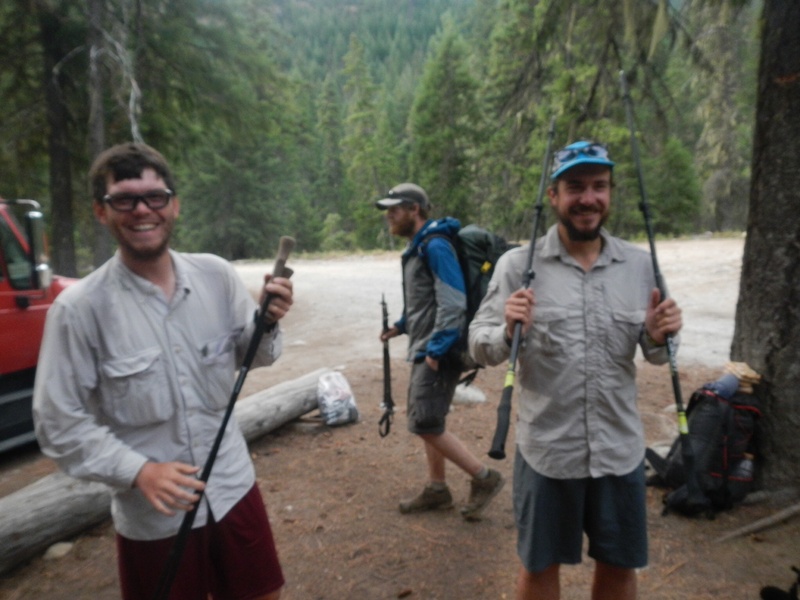 We need to cover 26 miles today and tomorrow, plus another 7 the next day before the 9am bus to make it into Stehekin in time for the Post Office. 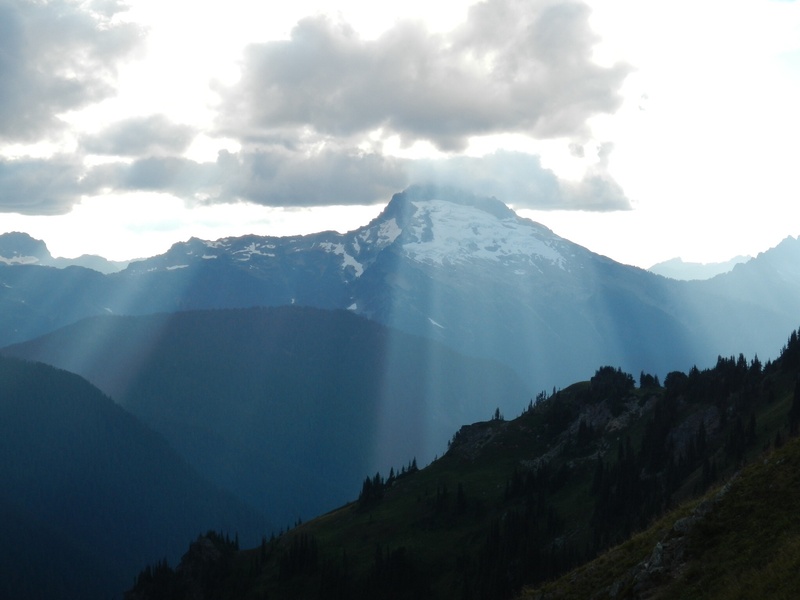 Today is gorgeous but tough, as we traverse around the awesome Glacier Peak. 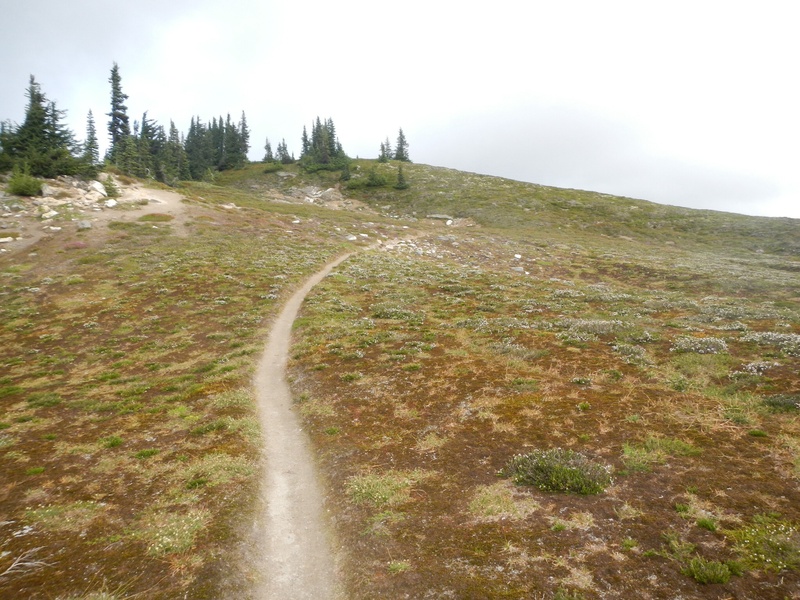 The section feels like the crux of the PCT with tough climbs, brushy trail and a rainy forecast. In the alpine hoary marmots are everywhere and their shrill whistles in concert with the squeaky bark of the Pika become the soundtrack to our day. 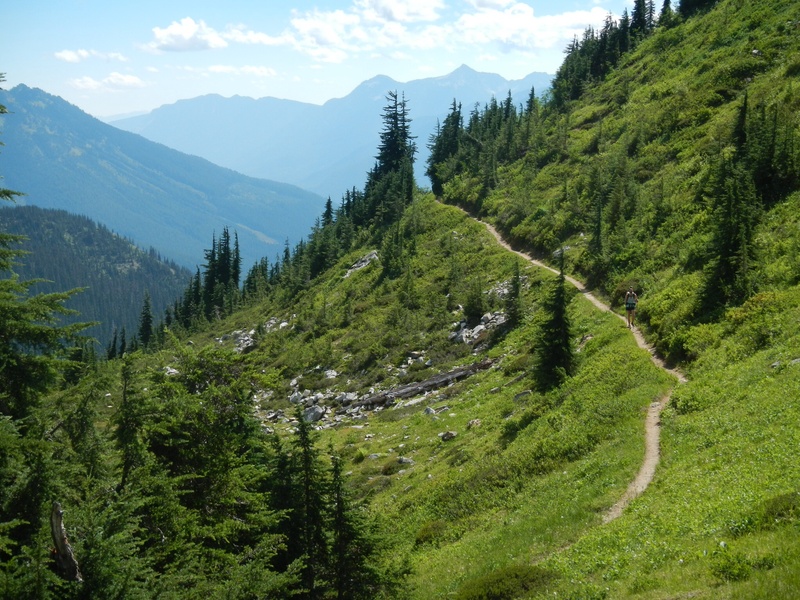 By mid afternoon we descend 3000′ to cross Milk Creek. Nearing the bottom, I spot an old trail that crosses the creek higher up. 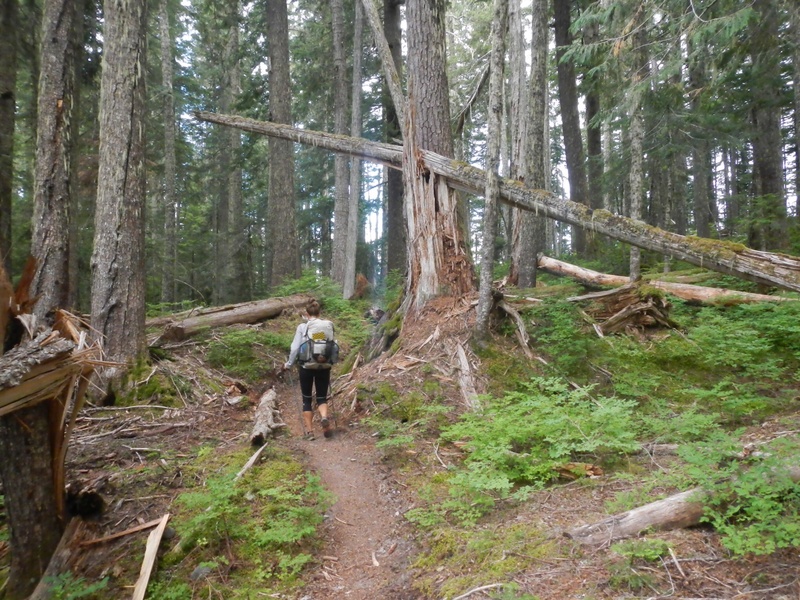 I convince T-Fox to give the seemingly shorter route a try, so we bushwhack through Devil’s Club towards the crossing. 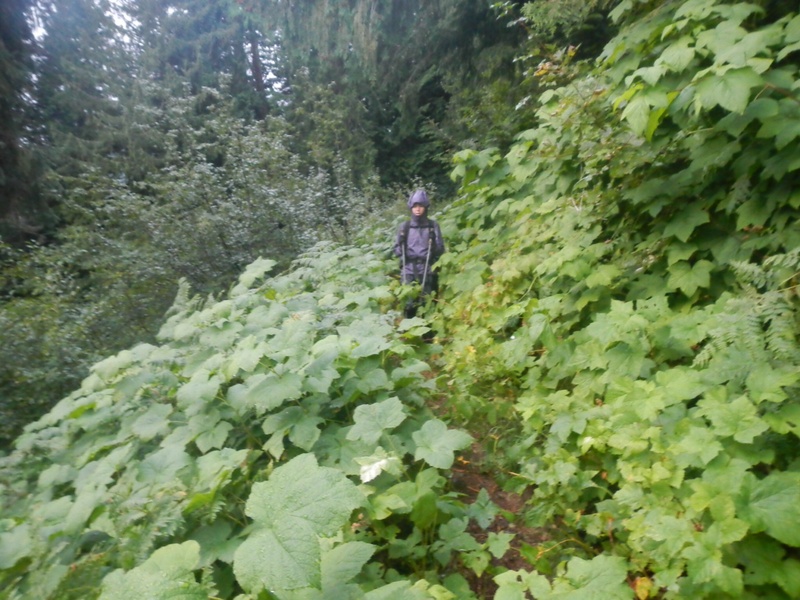 After 200 yards the trail disappears at a washout/landslide, so I use a sapling trunk to rappel 15 feet down the loose dirt wall to the creek. T-Fox is less impressed but eventually we get her down. 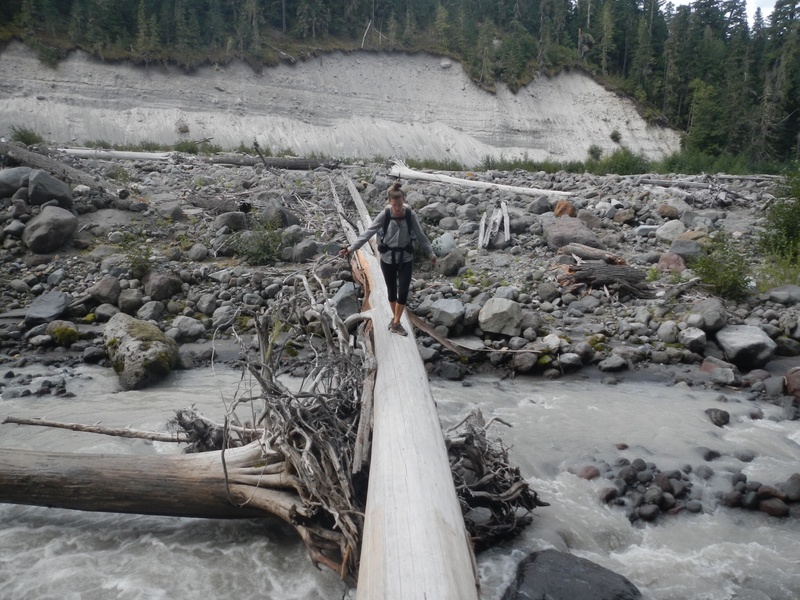 The bridge here is long gone, so we spend 20 minutes scouting a crossing of the milky glacier creek. 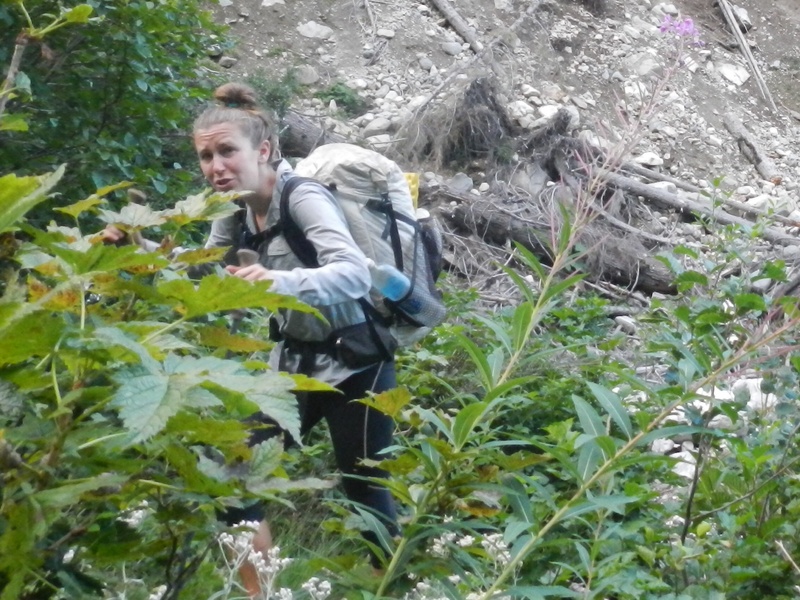 We climb up to where the creek is braided into thirds and make a reasonably easy crossing. 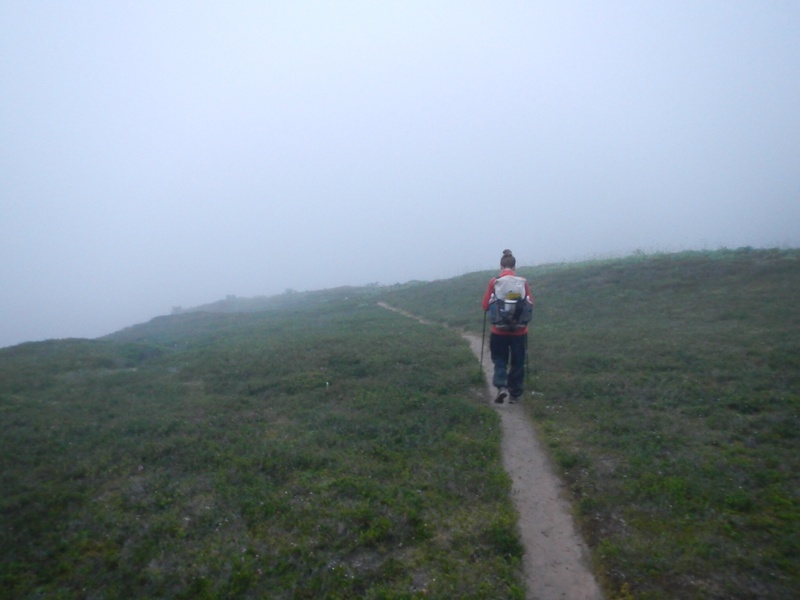 Soon after we rejoin the PCT, having spent an hour to “save” what we later learn was 1.1 miles. By 7pm we’ve climbed out of the valley and covered 24 miles. 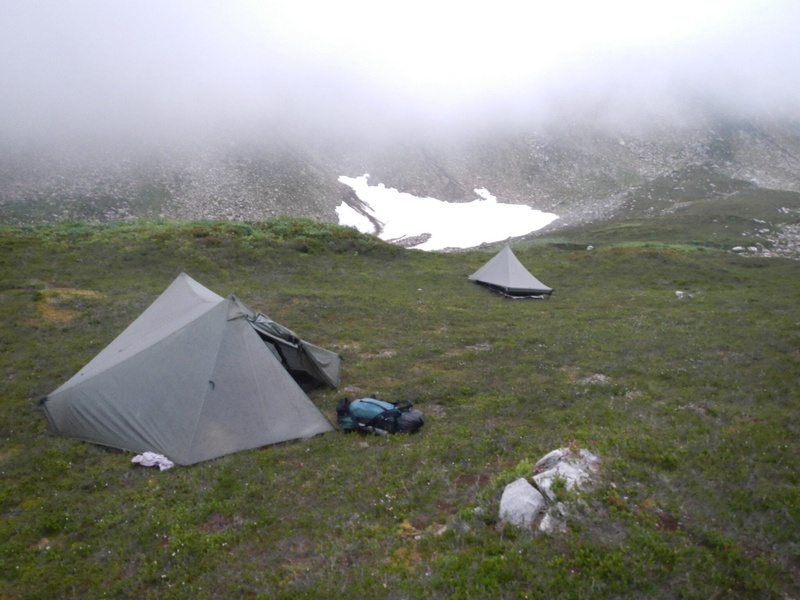 Exhausted, we set up camp on a sub-alpine ridge. 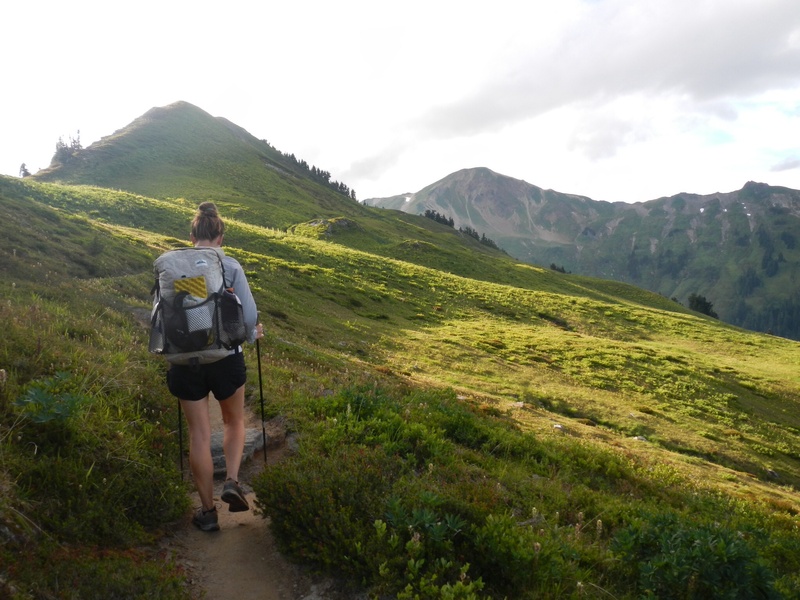 We’re a bit disappointed to have the miles math tipped against us by the tough terrain. There’s 35 miles left to town and we have to catch the 9am bus the day after tomorrow or be stuck in Stehekin for 3 days. Today we get on trail a few minutes early at 6:20 am. 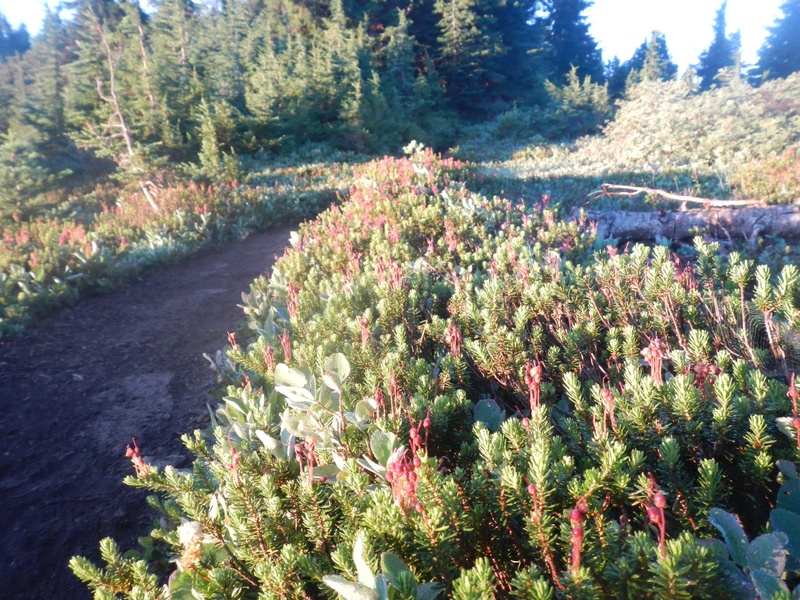 The alpine vegetation is wet as usual after a cold night. 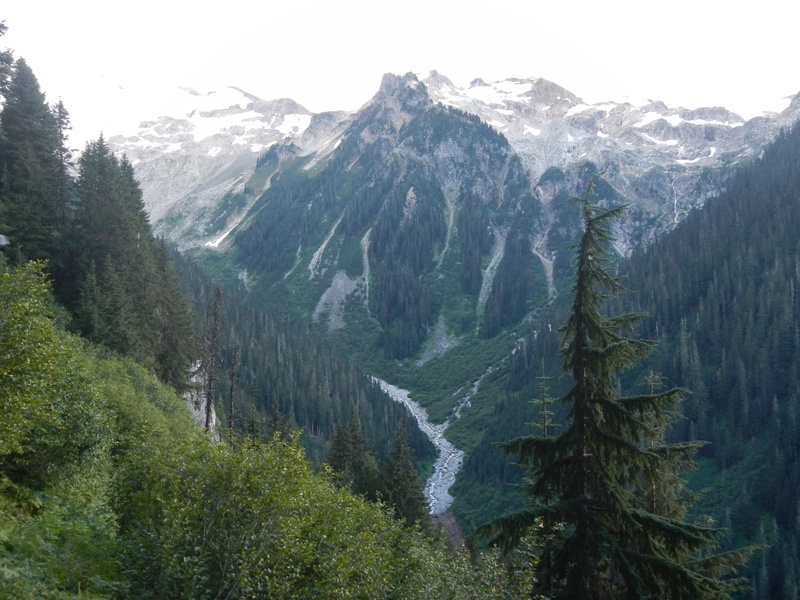 We descend towards the Suiattle River as the old growth trees increase in size. 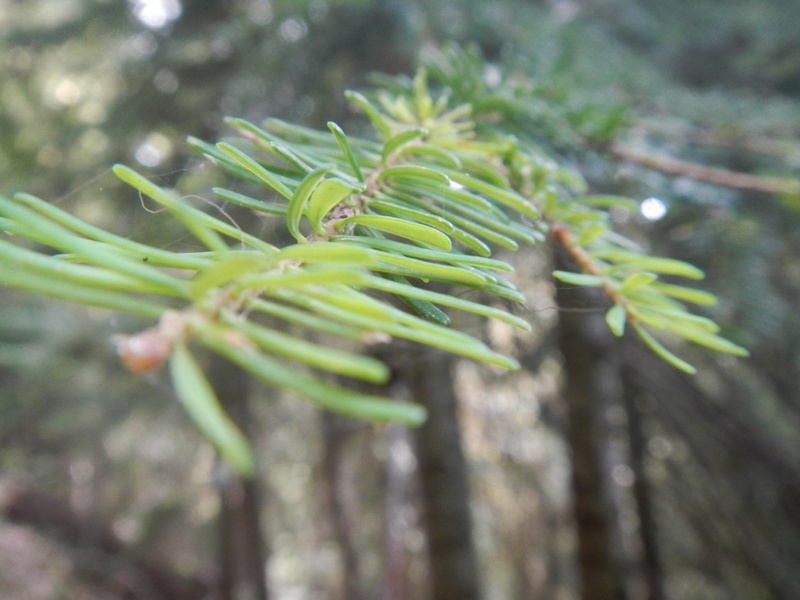 Soon we’re in a forest of huge Western Hemlock, Red Cedar and Douglas Fir. We scramble over a fallen and shattered red cedar that fills the air with its unique fragrance. It feels like we’re making good time, but the map says we’ve only covered 4.5 miles by 8:30 am. 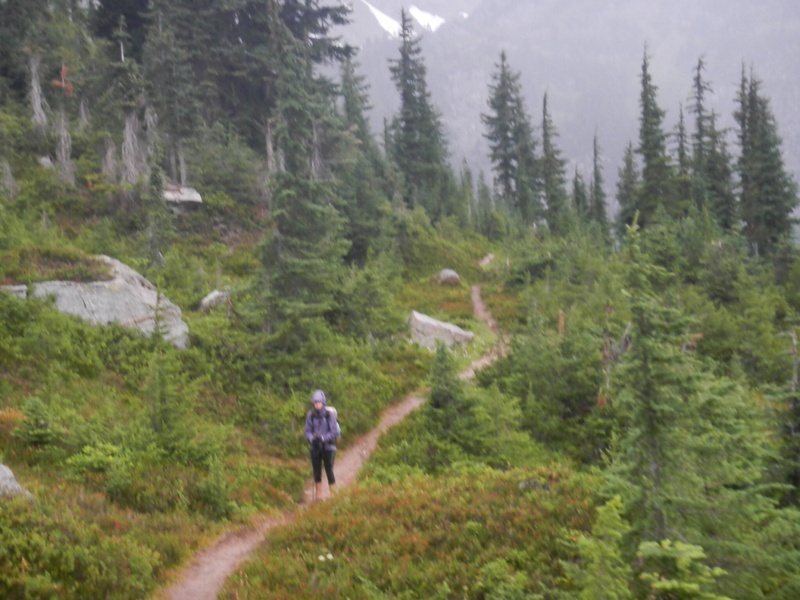 We’ve already decided to take the old PCT route across the river. 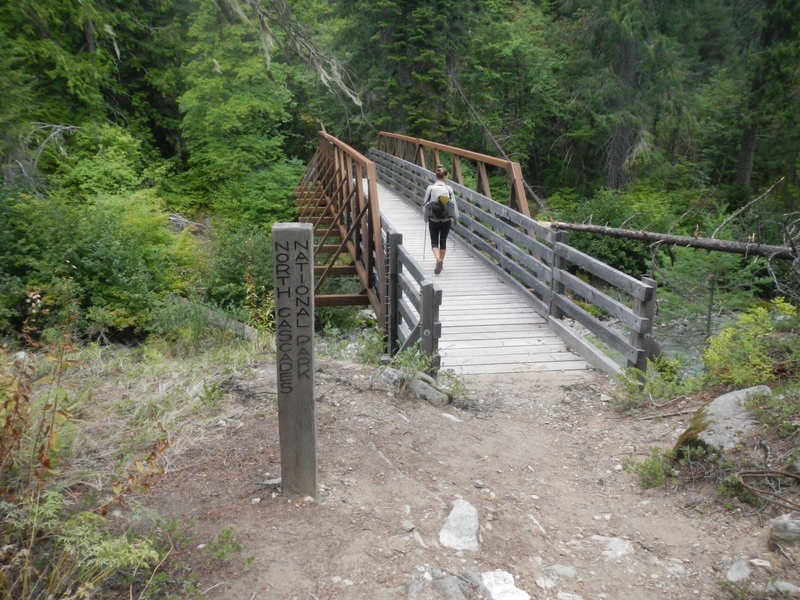 It’s 5 miles shorter than the new PCT which was re-routed in 2011 after the upper bridge washed out. We’ve already factored these mile savings into our math, so the brushy older route feels more like a set back as we struggle with two difficult creek crossings and many fallen logs. 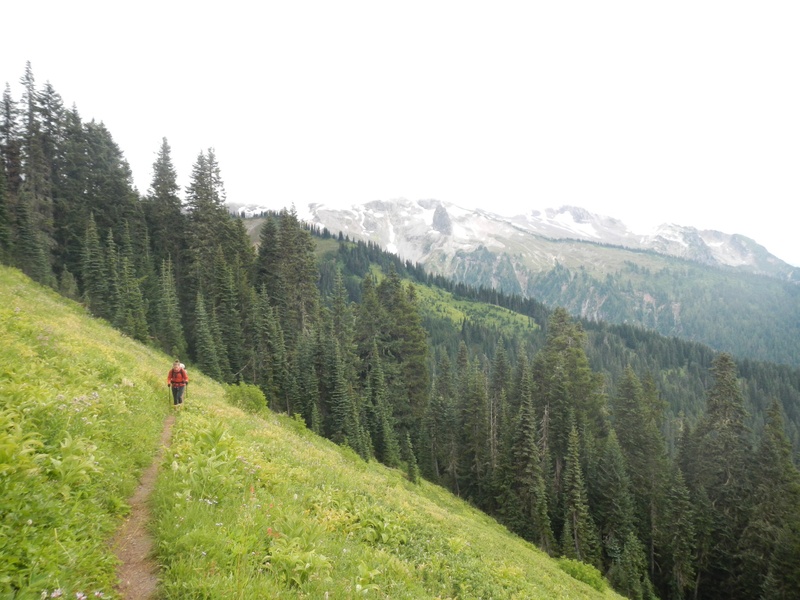 Light rain starts as we begin the ascent out of the deep Suiattle drainage. We break at 4pm at the pass but chill quickly as rain starts to fall. 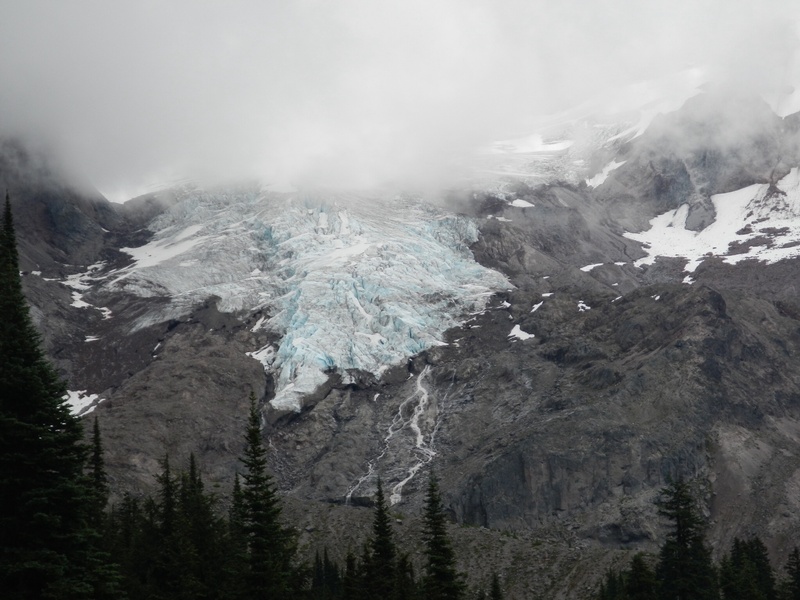 We resume waking and try to hurry as we are far behind on miles, but the talus fields, scree bowls and overgrown avalanche chutes all dictate a slow speed. 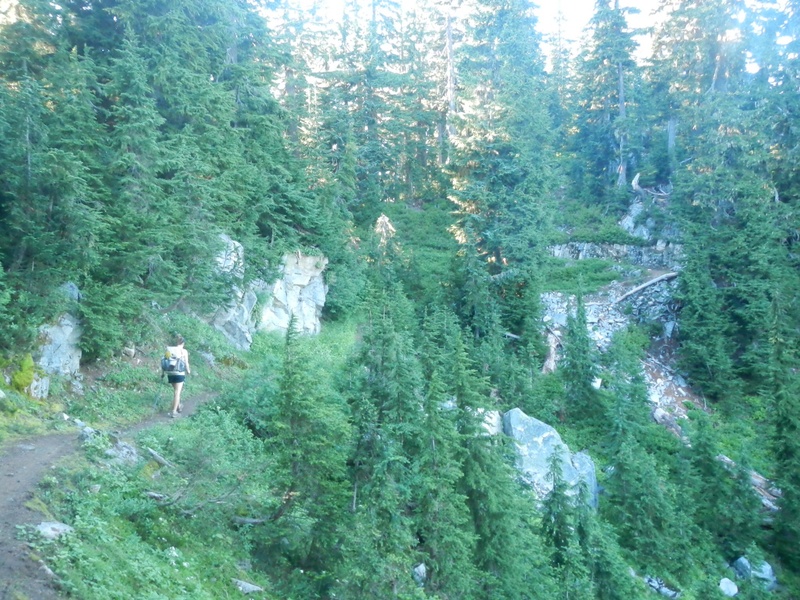 Finally we reach Agnes Creek at the valley bottom at 7:30pm. There’s a campsite here but it’s closed due to hazard trees so we press on. 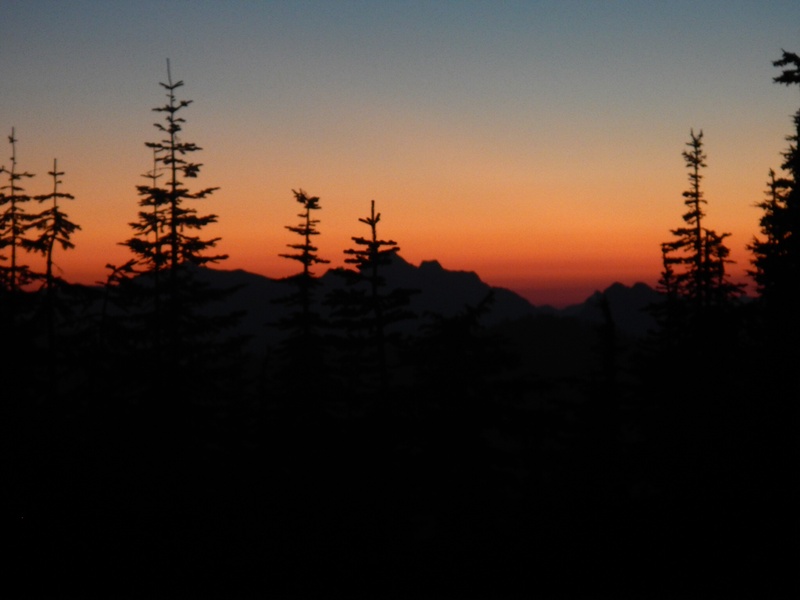 Darkness falls quickly as we hike and search for a site. Tired, we finally camp on a blanket of ferns after 23 tough miles. As our sharp cheddar Annie’s Mac ‘n Cheese cooks, we discuss options for tomorrow. Our slow progress has left 12 miles between us and the 9am Stehekin bus. I offer to start early at 4 am and hike it solo, but T-Fox doesn’t want to be left behind. We consider missing the bus and hoping the Post Office will give our package to Knock-Out who has my ID and is ahead. Eventually we decide we’ll both hike out early, which means a 3:30am start as T-Fox’s top speed is a bit slower. With the alarm set for 2:30 am, we fall asleep on a lumpy bed of ferns. Lorax’s alarm goes off at 2:30 a.m. and he quietly and slowly stirs, going about his morning duties. I lay in my down sleeping bag, dreading the moment when he gently reminds me that I need to get up too. What an ungodly hour to get up! We wait for the 9 a.m. bus to arrive, along with some other hikers – Knockout, Pillsbury, Jukebox, and Ian. Upon arriving to Stehekin bakery, we are in heaven. 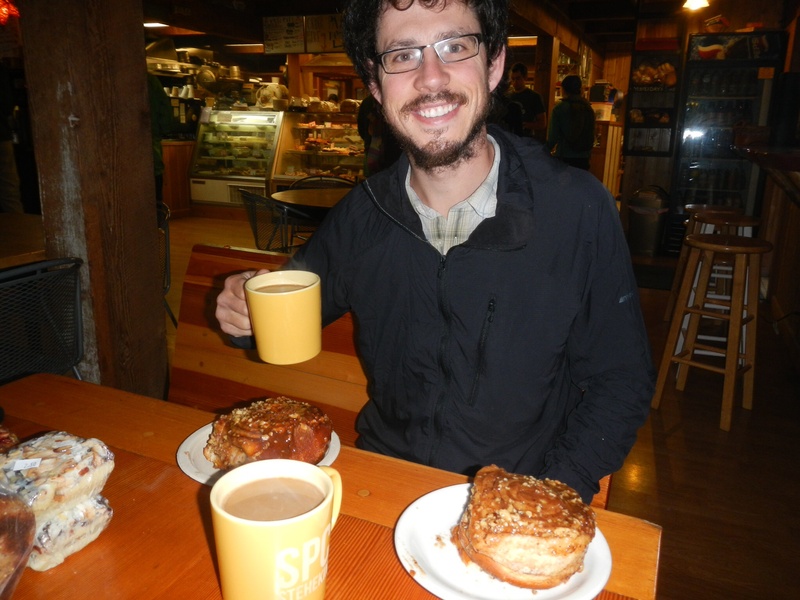 This bakery is LEGENDARY…a PCT-thru hiker dream come true. 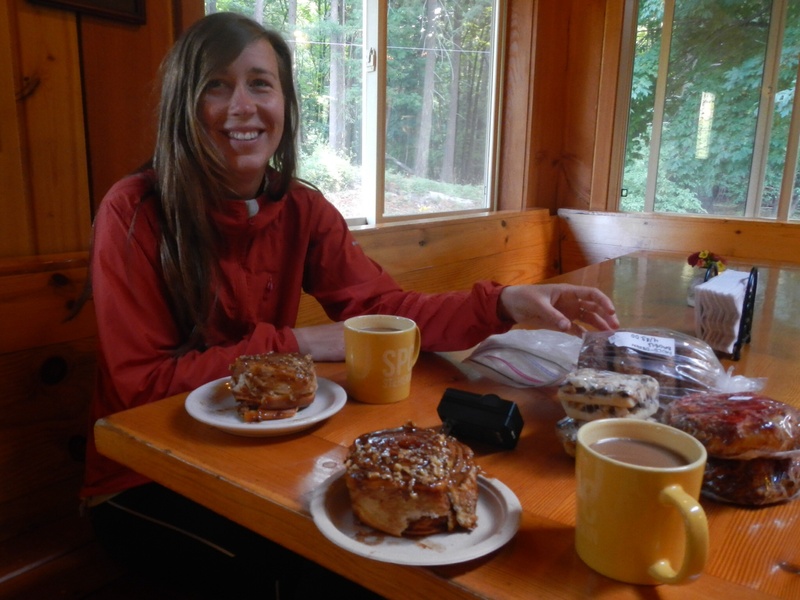 Lorax grabs a coffee and giant sticky bun and heads back on the bus to sort out our camping and to hit the post office. I lounge around the bakery with other hikers, feeling the stoke to finally have made it here! 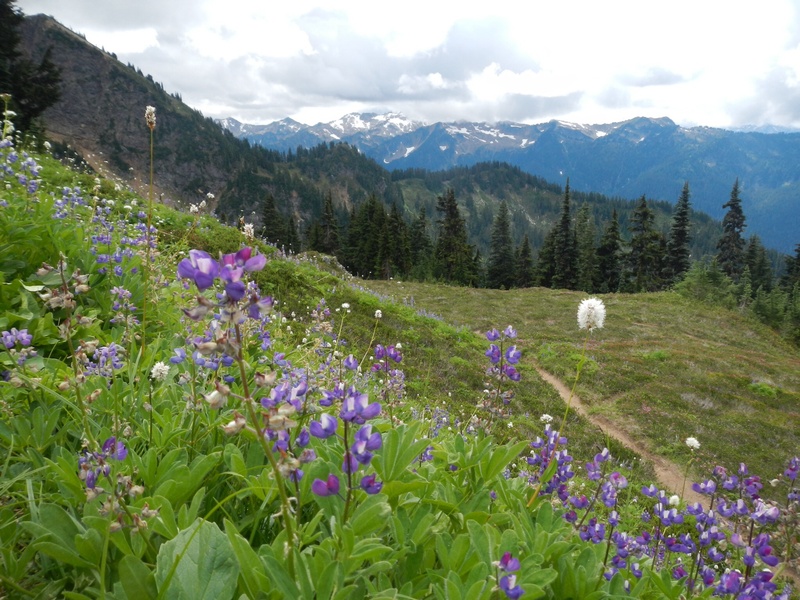 We guzzle coffee, eat more sweets than should be legal, and reminisce about our hike. Everyone seems shocked to even be here…so close to the end…we try to put how that feels into words, but it’s so dang hard. The rest of the day is pure bliss. I love Stehekin! What a great final town before the end of this whole hike. 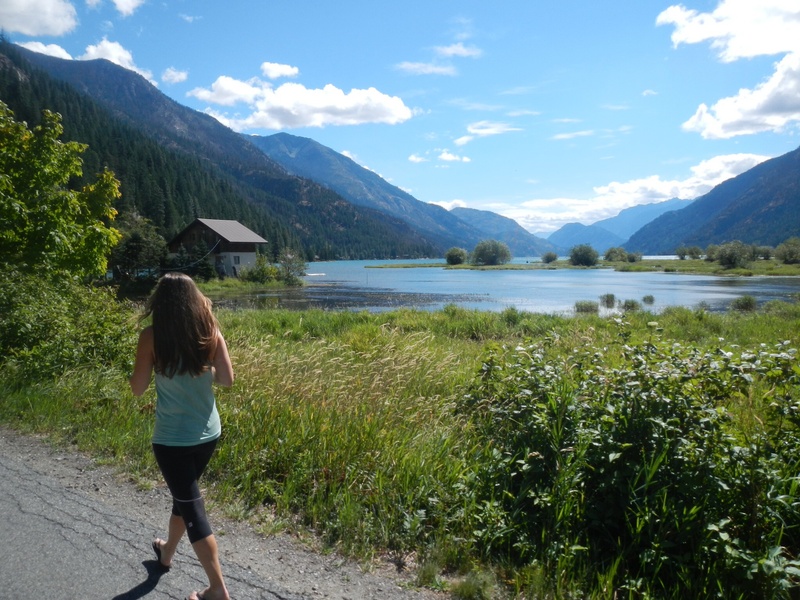 We take the entire day off in Stehekin…something we rarely did in towns along this journey. It feels glorious to sleep in, spend the entire morning at the bakery (sticky buns AGAIN), and nap in the tent after lunch. Normally these things would make me feel so lazy…but we deserve it! We had to book it to town to be at the post office, and our bodies need the rest. Lorax and I walk around town, holding hands, trying to make sense of this crazy adventurous whirlwind. How can time fly by so fast, yet our start date of April 18th feel so so so long ago…? And we’ve walked every single step of the way! We didn’t get stuck by Forest fires! We have been so fortunate, not only to have this opportunity, but to have everything go so smoothly. Knock on wood T-Fox…this ain’t over yet! 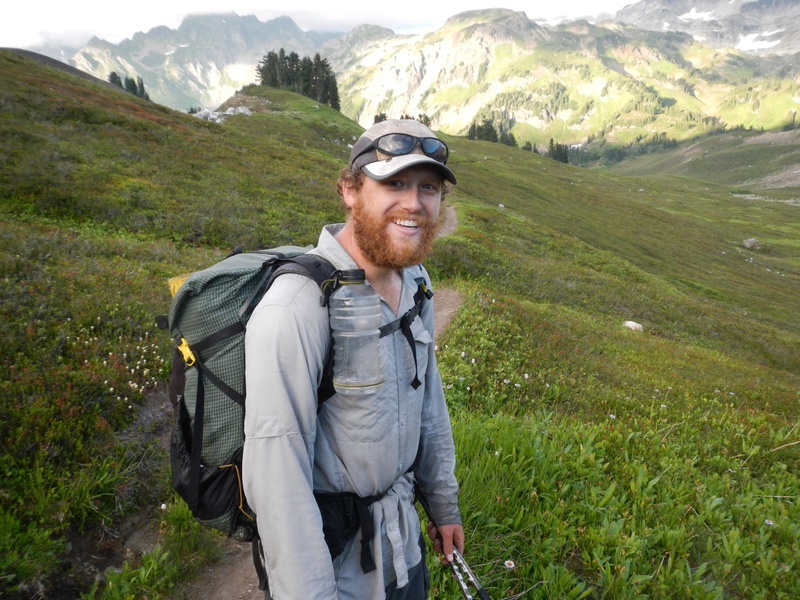 We say goodbye to several hikers that we won’t be seeing agin – knockout, Freckles, Jawbone and Liverpool. They’re heading back to the trail earlier than us, so they’ll beat us to Canada. It’s sort do sad how this is all wrapping up. 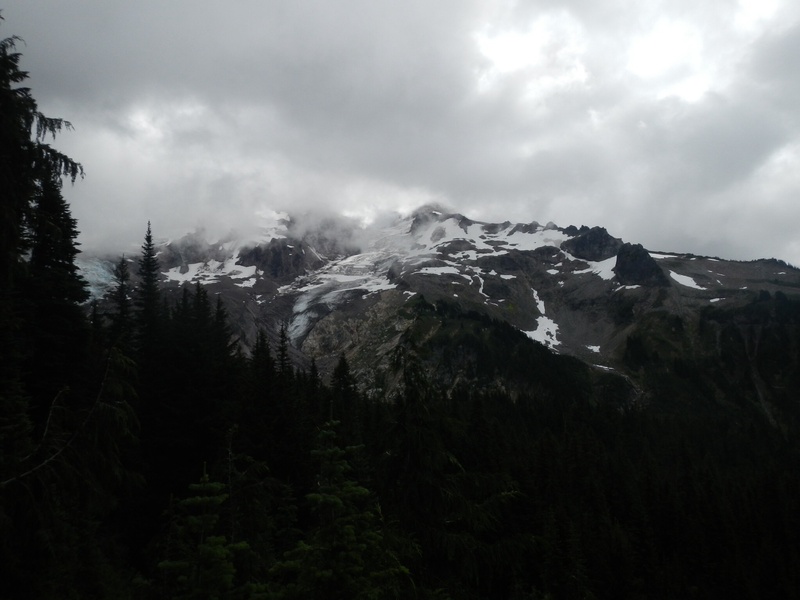 Our traveling band of hikers is spreading out…it’s surreal. Oh but the hat has made the man! Grass, get some grass and weave it back together. When this is all over that hat deserves a place on the (office) mantle. Great Photos and words guys. Haven’t seen you guys since Kennedy Meadows, but the memory of being abandoned in Mojave is still burned in my mind. Congratulations. If you’re ever in Salt Lake City, holler. Loved, being a part of your incredible journey.